The 4-Strain Cannador® is perfect for someone who likes to keep two ounces on-hand since each glass cup fits 1/2 oz (or up to 3/4 oz ground). You can customize your Cannador® to either have ventilated lids with a humidifier or airtight silicone lids with no humidifier. 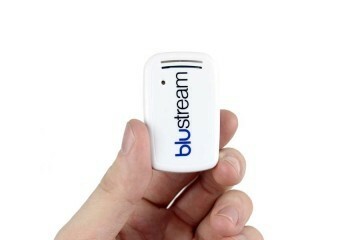 It comes with 2 keys and a lock, so you can keep your strains safe and secured. 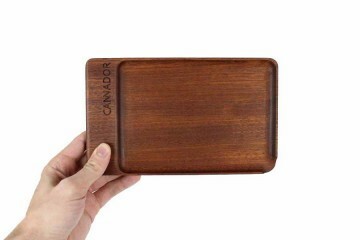 The 4-Strain Cannador® has several layers of wood and a double edged seal so no smell will escape. Choose the exterior wood type of either cherry, which is a lighter more blonde color or walnut, which is darker brown. The finish is a clear matte to give a more natural look and feel to the wood. The 4-Strain Cannador® can hold a larger quantity of four of your favorite strains. Each removable glass cup holds 1/2 oz for a total of two ounces. This is an excellent option for someone who enjoys larger quantities. 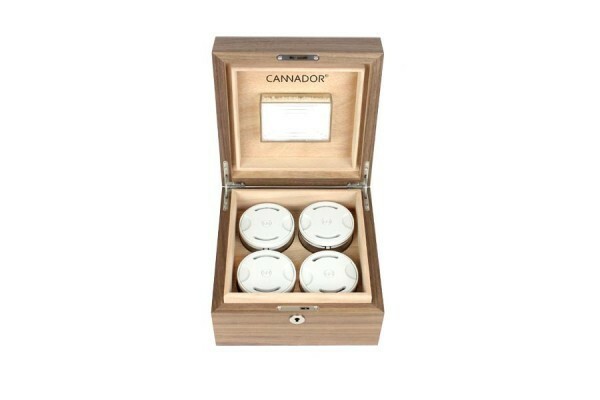 This Cannador® has a lock so you can keep your contents safe and secure. It is lined with mahogany on the interior and you have a choice of either cherry or walnut on the exterior.